Drunk driving combines two of America’s favorite pastimes: getting absolutely hammered and driving an automobile. But before the invention of the modern breathalyzer in the 1950s, determining if someone was too intoxicated to operate a motor vehicle was incredibly subjective. It took decades for law enforcement technology to catch up with one of our most pervasive crimes. Before the advent of the car, being drunk was a relatively minor nuisance for society at large. Most of the time, imbibing too much of your preferred poison did little to put strangers in harm’s way. The automobile, with its incredible speed and considerable weight, changed all that. Today, roughly 30% of America’s traffic fatalities involve a drunk driver. Back in the 1950s and ‘60s, that percentage was closer to 50%. Those staggering numbers kicked off the pursuit of a simple device, one that could determine any defendant’s guilt with the push of a button. That was the hope (and fear) of people who were fighting over the development of the very first breathalyzer technologies. After World War I, the car was becoming increasingly popular on American roads. What had once been a plaything of the rich was quickly finding its way into the hands of people with more modest incomes. And despite the passage of alcohol prohibition in 1920, more and more Americans were getting drunk before sliding behind the wheel. The first serious scientific work on mechanizing the determination of whether someone was driving drunk took place in the 1920s. A doctor and researcher in Los Angeles by the name of Dr. Emil Bogen conducted a landmark study in 1927 on how to scientifically determine inebriation. By this time it was fairly well-established that testing blood gave you a solid idea of how drunk a person might be. But by testing urine, blood, and breath, Bogen found that the latter could indeed function as a reliable estimator for blood alcohol content (BAC). Dr. Bogen’s breath test used a large football bladder that contained sulphuric acid and potassium dichromate. A patient would breathe into it, and as the chemicals in the football bladder changed from yellow to various shades of blue and green, they were compared to tubes of the same chemicals in which different amounts of alcohol had been added. Effective, but not the most practical for a traffic stop. McNally was a chemist whose early breathalizer-like device used the same principles as Dr. Bogen; blowing into the tube of the device would cause the chemicals to turn a greenish hue if there was any alcohol present. Photos of McNally’s device ran in popular tech magazines, promising that soon, there would be a reliable and objective way to determine if someone had indeed been driving drunk. By the early 1930s, more and more researchers in the United States and Europe were becoming interested in different ways to test for intoxication. And for good reason. The prohibition on alcohol was repealed in the U.S. in late 1933, creating an even greater sense of urgency among public health officials and scientists who were concerned about drunk driving. Too many people were dying on the nation’s roads, and it was clear that alcohol was a major factor. In Chicago, drunk driving deaths quadrupled in the first six months of 1934 over the same time the year before. In Los Angeles, city officials noted a similar rise in drunk driving injuries and fatalities. A biochemist at Indiana University by the name of Dr. Rolla N. Harger first announced his own method for measuring alcohol by means of a breath test in 1931. By 1938, Harger had a working device that was being tested by the Indiana State Police. The first real-world test of Harger’s device was conducted by the Indiana State Police on December 31, 1938—75 years ago today. By 1940, other police departments around the country were using Harger’s device, pictured above at the New Jersey Police Department that year. When people asked Harger (pictured below) and his research team what they called their new alcohol breath analyzer, they jokingly said the “Drunkometer.” But joke or not, the name actually stuck. Harger’s wasn’t the only breathalizer on the market competing for attention. There was also the Alcometer, developed in the early 1940s by Leon Greenberg and Frederic Keator at Yale, as well as the Intoximeter, pictured below in use by the L.A. Police Department. These devices went by different names, but they all employed the same principles: comparing the ratio of carbon dioxide and alcohol in a person’s breath to pre-mixed alcohol solutions. These were then translated to the equivalent measurements in the blood. But even as the technology slowly evolved and improved in the first half of the 20th century, the qualifications for what was considered “too drunk” to drive also changed. Scandinavian countries were ahead of the curve in adopting strict limits on drunk driving. In his 2011 book One For The Road, Barron Lerner explains that Norway’s BAC limit was 0.05% by 1936, while Sweden’s was 0.08% by 1941. Fascinatingly, the justice system was especially lenient in part because of the many recent failures of alcohol prohibition in the U.S. during the 1920s. Even organizations like the AMA and the NSC thought it best not to be too harsh on people who drove drunk. Today, the federal limit in the U.S. is 0.08%. That’s much more in line with other countries, but still more liberal than most. America saw another explosion in automobile ownership after WWII, as expansion of the suburbs caused many people to drive greater distances (with and without a drink) than ever before. But testing for intoxication was incredibly controversial, even in the 1950s. Countless people tried to challenged the efficacy of the devices. Could Harger’s Drunkometer really hold up in a court of law? In 1950, Harger wrote a defense of his invention for the American Journal of Police Science. Titled, “Debunking” The Drunkometer, Harger outlined the many ways in which his new device had been challenged over the last decade. Harger came out swinging, quickly knocking down every possible criticism and each way people could allegedly beat the test. One criticism published in a letter to the Journal of the American Medical Association in 1940 claimed that a lack of oxygen would create a false positive in chemical tests for intoxication. So what did Harger do? He drowned 50 rabbits in his lab and took blood tests, proving that there were no false positives for intoxication in the dead animals. Not very nice for the rabbits, but Harger certainly proved his point. Another criticism continually leveled against Harger and his ilk was the fact that breath tests aren’t a direct measure of alcohol in the blood. Lawyers and lobbying groups contended that because every breathalyzer had to convert the alcohol-carbon dioxide ratio that it finds into a blood proportion to be understood as BAC, they were unreliable. With over two decades of research now under his belt, Harger was more than ready to contest these claims. His Drunkometer, though, was about to get usurped by a new technology for roadside breath testing. In 1954 Robert F. Borkenstein invented the Breathalyzer. Borkenstein had been hired as a police photographer at the Indiana State Police Lab in 1936, and quickly became interested in drunk driving thanks to the work of Harger and his Drunkometer. Police departments were becoming more and more interested and confident in breath test technology, thanks in large part to the advancements of Borkenstein’s technology. Gone were the football bladders and complex solutions that needed to be mixed, in their place a device whose reliability—and portability—would truly set it up as an essential tool in every police officer’s toolkit. During the 1950s, the American public and the judicial system were still erring on the side of the drunk driver. Oddly enough, some people were concerned that the mechanization of measuring sobriety was somehow not fitting with the American way. With an attitude that seems counterintuitive to many of us here in the 21st century, people didn’t trust machines more than a cop’s testimony of slurred speech or sloppy behavior. 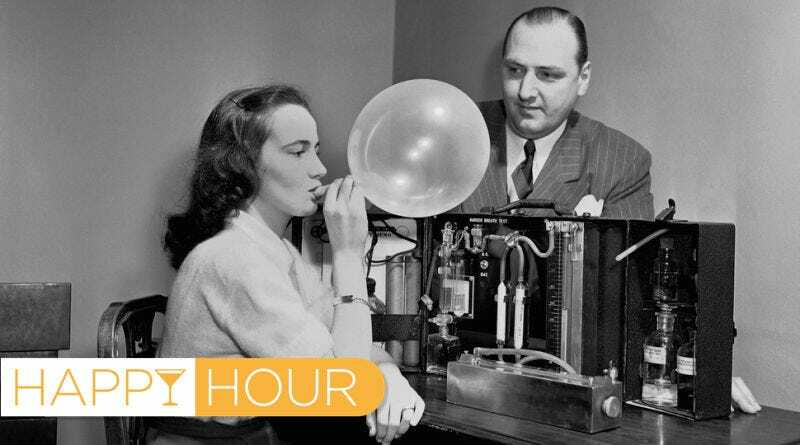 Opponents even had a name for the rise of technologies like the breathalizer: push-button justice. A 1955 article in the Virginia Law Review by Edwin Conrad explained that the concerns about push button justice were even larger than just one issue. Conrad argued that new scientific advancements—such as improved photographic technology, radar for measuring traffic speeds, and yes, Drunkometers for determining a driver’s level of intoxication—should be embraced to move society and the field of criminal justice forward. Push-button justice was nearly here. But American public attitudes were still seemingly stuck in the 1930s. The 1960s brought about a turning point in the public health community. Borkenstein conducted a landmark study in 1964 known as the Grand Rapids Study which concluded that there was a definitive link between increased BAC and car accidents. Amazingly, people were still debating in the 1960s whether drunk driving really posed a risk on the nation’s roads. Just a few years later, in 1968 a study by the U.S. Department of Transportation found that about half of the nation’s auto fatalities (about 25,000 deaths) involved alcohol. Slowly but surely over the course of the next two decades, Americans would come to see drunk driving as without question dangerous and immoral. And the technology for testing BAC (which would become electronic by the end of the 1970s) would help put an end to an era that some people called the Golden Age of Drunk Driving. Tonight, police officers will be out in full force looking for drunk drivers. And some departments (like the LAPD) even have new tests to quickly gauge whether a driver has been using any other forbidden substances—like marijuana, cocaine, or even prescription drugs like Xanax. With the legalization of marijuana for recreational use in states like Colorado, society is yet again debating what acceptable levels of intoxication there may be before someone gets behind the wheel. Only this time it seems that marijuana has an uphill battle. At the beginning of the 20th century, drunk drivers started with the benefit of the doubt and societal norms evolved to a point of low tolerance for such behavior. Unfortunately for fans of weed, they’re starting here in the 21st century with just the opposite.